To confirm your booking we will require a non refundable deposit of £150.00 per week with the remaining balance due 10 weeks prior to your arrival date. Payments can be made by credit or debit card, PayPal or Bank Transfer. Please note that we charge a fully refundable damages deposit of £75.00 with all first time bookings which is returned within 7 working days of your departure. 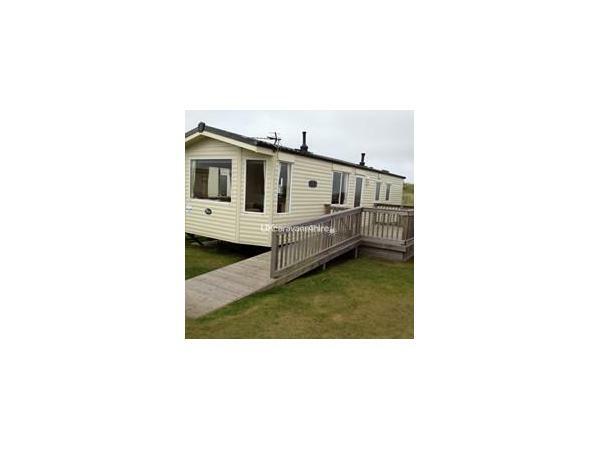 We are happy to accept well behaved dogs in this caravan for an additional charge of £35.00 per dog per week, maximum 2 dogs per booking. 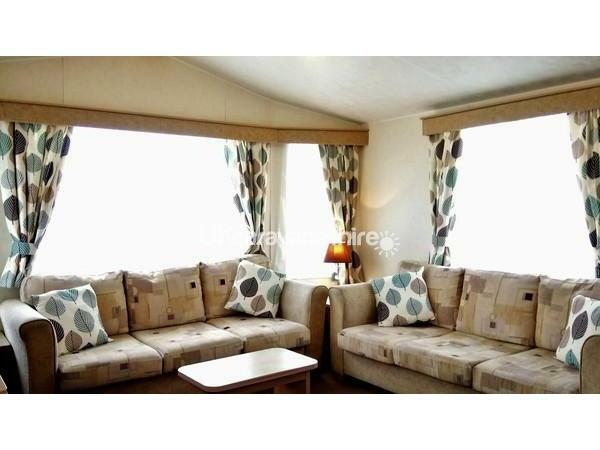 Our 2009 Atlas Moonstone Special Edition is a very spacious 6 berth caravan with one large double bedroom, one twin bedroom and a double sofa bed in the lounge. 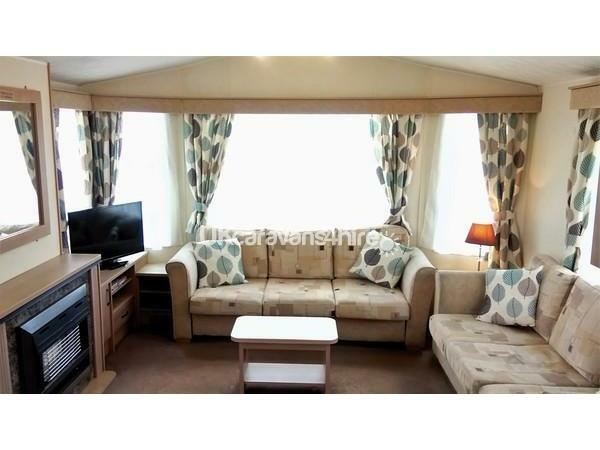 This spacious caravan benefits from its own private parking space and an access ramp leading up to the decked balcony which has its own gate, ideal if bringing your dog with you. The addition of panel heaters in the bedrooms and bathrooms make it an ideal choice throughout the season. The Lounge has ample seating with its two free standing sofas and a wrap around corner sofa in the dinning area. We have supplied a 28inch LCD TV/DVD combi with built in Free-view and there is also a gas fire for extra comfort in the cooler months. The open plan Kitchen is very well laid out with plenty of storage cupboards and worktop space. 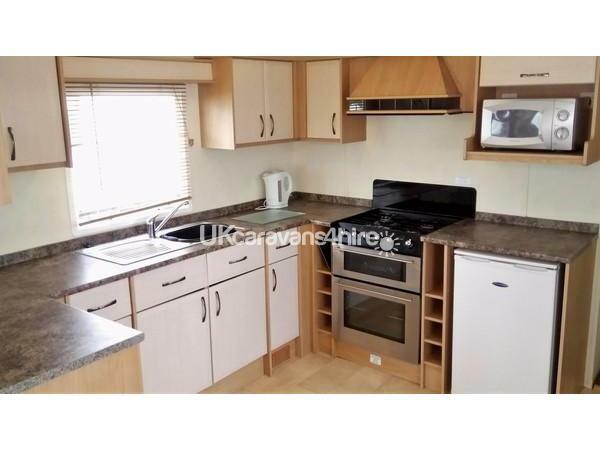 There is a gas oven and 4 ring gas hob, a microwave and a full size fridge with freezer compartment along with a kettle, toaster and full crockery and cutlery inventory. 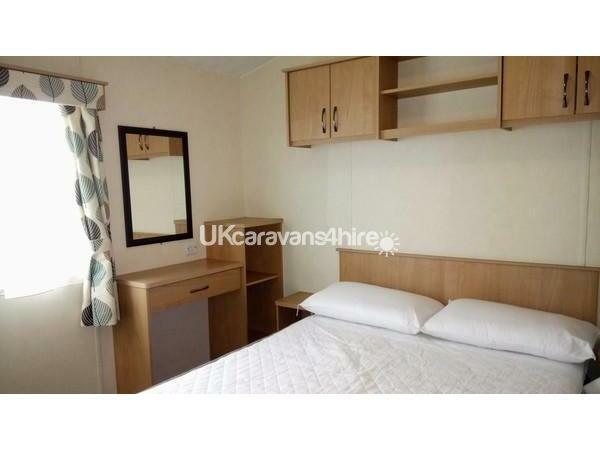 The large double bedroom consists of a double bed, two bedside cabinets and overhead storage units. 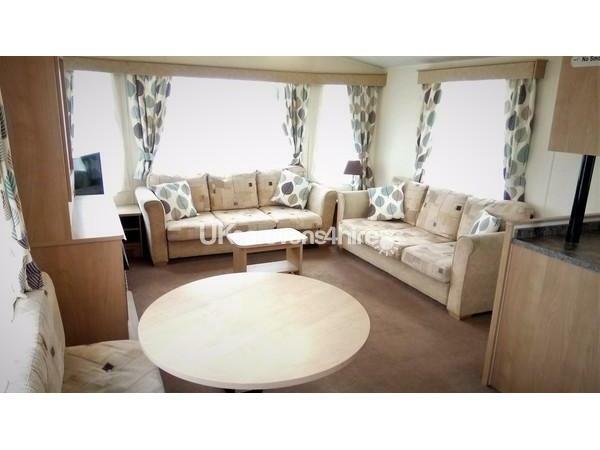 There is a dressing table with mirror above and a large built in double wardrobe with separate shelving unit. For extra comfort a panel heater has also been fitted. Our twin bedroom has two single beds, a central bedside cabinet again with overhead storage units and a panel heater. 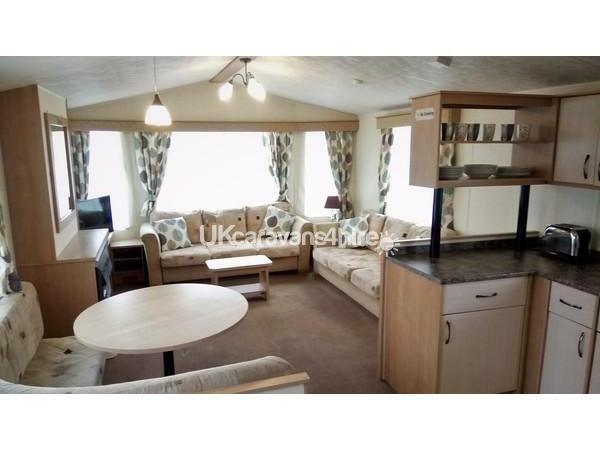 This caravan has a shower room with a large shower cubicle, sink and wall mounted bathroom cabinet and there is a separate WC both rooms fitted with panel heaters. 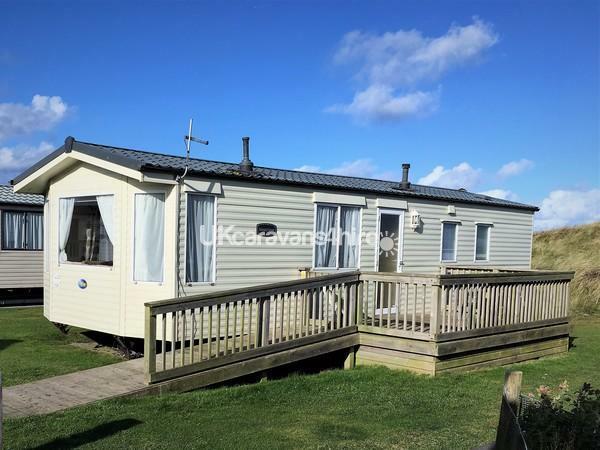 We have chosen a lovely pitch at the Kernow View area of Perran Sands which is just a 5 minute walk to the entertainment complex and stunning 3 mile golden sand beach. Please note that in order to keep our prices as low as possible guests will be required to provide your own bed linen and towels although we do supply all duvets and pillows including those for the sofa bed. However we can arrange for bed linen hire for an additional charge of £20.00 per week. 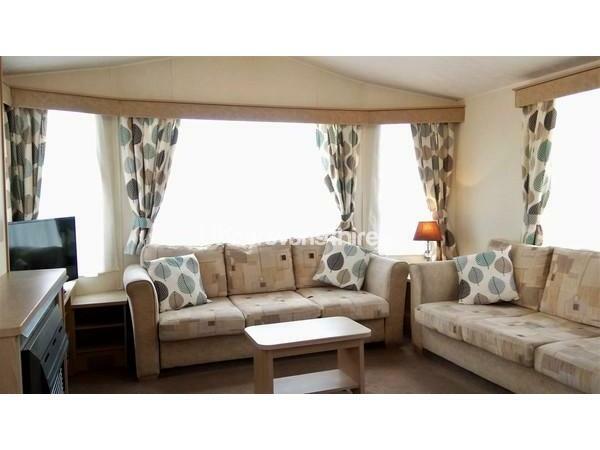 We are happy to accept well behaved dogs in this caravan for an additional charge of £35.00 per dog per week (max 2 dogs per booking). Entertainment passes are not included in the price but can be purchased from reception if required.